the Tjängvide image stone (pictured) is held to show a man, or Odin himself, arriving at Valhalla on Sleipnir where he is welcomed by a valkyrie? 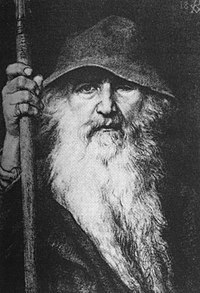 the medieval Swedish ballad "Stolt Herr Alf" contains an unusual name for the Norse god Odin? it is said that when the 10th-century Viking leader Onlafbald invoked the power of his Norse gods Thor and Odin, he was miraculously killed by the spirit of the 7th-century English saint Cuthbert of Lindisfarne? Votan, a legendary figure from Mesoamerica, has been erroneously identified with the Norse god Odin and the Mayan ruler Pacal the Great, among others, despite a lack of evidence? Starkad was a legendary Norse hero blessed by Odin but cursed by Thor? Question 1: The souls of women warriors, and those strong and beautiful women whom Odin favored, became Valkyries, who gather the souls of warriors fallen in battle (the ________), as these would be needed to fight for him in the battle of Ragnarök. 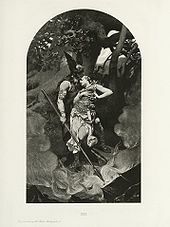 "Wotan takes leave of Brunhild" (1892) by Konrad Dielitz. Question 3: A likely context of the diffusion of elements of Celtic ritual into Germanic culture is that of the Chatti, who lived at the Celtic-Germanic boundary in ________ during the final centuries before the Common Era. Question 4: He also commands a pair of wolves named ________, to whom he gives his food in Valhalla since he consumes nothing but mead or wine. Question 5: In the Norse sagas, Odin sometimes acts as the instigator of wars, and is said to have been able to start wars by simply throwing down his spear Gungnir, and/or sending his ________, to influence the battle toward the end that he desires. 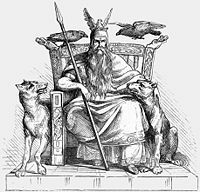 Question 6: ________ is named after Woden, the English form of Odin (Old English Wēdnes dæg, "Woden's day"). Question 7: Adam claimed to have access to first-hand accounts on pagan practices in ________. "Odin and the Völva" (1895) by Lorenz Frølich. "Odin's last words to Baldr" (1908) by W.G. Collingwood. Question 9: Many toponyms in ________ where Germanic Tribes existed contain the name of *Wodanaz (Norse Odin, West Germanic Woden). Question 10: The fickleness of Odin in war was well-documented; in ________, Loki taunts Odin for his inconsistency.